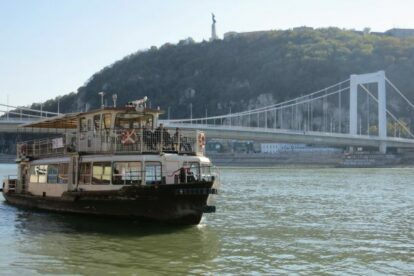 Get a real picture of Budapest, travel with locals on BKK (Budapest Public Transport Services) instead of a crowded tourist boat and pay 90% less! Many companies offer boat cruises on the Danube from €15 up to €50, depending on the package they offer. Although it can be fun overall, I would go for another option costing 350 HUF for a single ticket, or for free with a Budapest Card or pass. Here is how: choose the D11 boat from Egyetemváros (University quarter), which is near the great white concert boat (check the A38 article). I like to go up to Népfürdő station because all the important spots are on this route. Oh, I wish I could take it every day… I love the river and get some amazing views from the BKK boat. There are many ways to get to the downtown area again within 10 minutes. Use BKK web to check the schedule. The boat service runs all-year-round if the weather allows it and operates full time from March 1st.